CRASHSpace made a huge splash at Create:Fixate on this past July 16th. Create:Fixate is an organization dedicated to elevating the accessibility of art through mixed medium exhibitions and educational programs for emerging artists, art collectors, and musicians. We had an amazing showing. This downtown pop-up art museum hosted collections from local artists as well as some international street artists, from known to unknown. Left: Focus, a piece which rewards users for standing still. Right: Store Front Music, a piece which encourages movement. 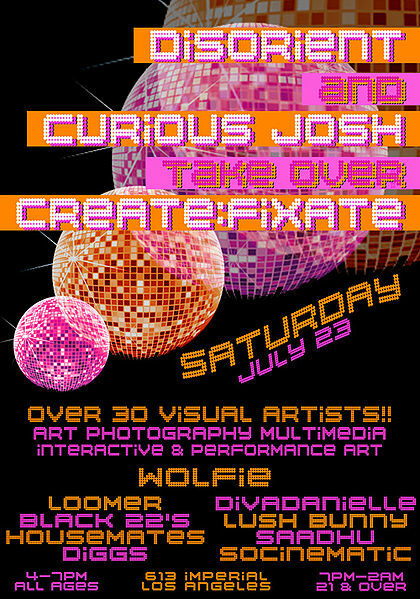 This weekend, due to overwhelming demand and fears over #carmageddon, Create:Fixate is opening for an unprecedented second run. The outdoor area and musical soundscape will be reimagined by the long-standing Burning Man collective DiSORiENT. Bring your pornj and prepare to rock out!